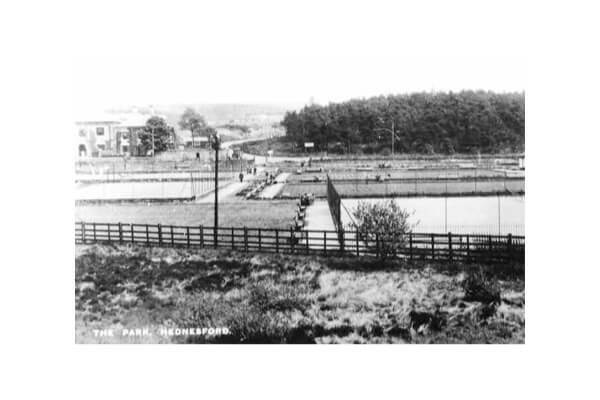 The whole of Hednesford Park was once Hednesford Pool, a large body of water that covered over 27 acres of land. The site was originally known as Hedgford Pool as this was Hednesford’s early name until the 18th century. The 1834 edition of White’s History Gazetteer & Directory of Staffordshire tells us that the pool abounded in pike, perch and roach. A number of adjacent properties took their name from the pool such as ‘Pool Cottage’ and ‘Pool View’. In 1874 the Cannock & Rugeley Colliery Company opened a coal mine on the opposite side of Rugeley Road in a valley behind Cockpit Hill on the Hednesford Hills (a few hundred metres away from the pool). It became known as the Valley Pit but was originally called the Pool Pit because the pool still remained. However, in order to prevent periodic flooding of the mine, the colliery company diverted the Bentley Brook that fed the pool. As a result in the late 1880’s the pool began to dry up and by 1900 it had dried up completely. Picture: Hednesford Park in c1931. Some years later, in 1931, Hednesford Park was opened. It was handed over to the local Council by Cannock Chase Miners’ Welfare Committee. Funds for the park had been raised over a number of years by placing a levy of one penny per ton on all coal produced by local mines. By 1930 some £15,000 had been collected. During the opening ceremony, Colonel Williamson, chairman of the committee, declared that he ‘hoped the ground would be appreciated and be a big success and a blessing to the people of Hednesford’. 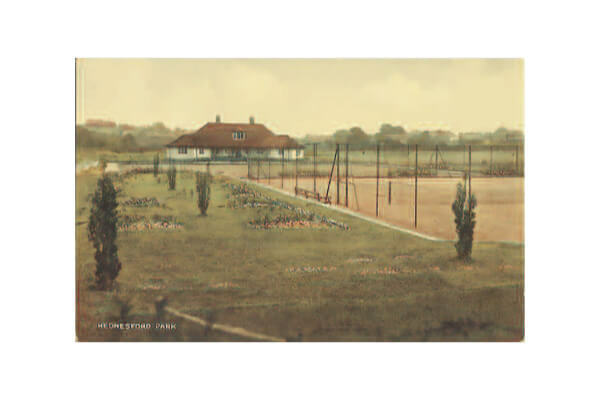 The new park had two bowling greens, eight tennis courts, putting greens, a cricket pitch and a pavilion with changing facilities. Although the putting greens and cricket pitch have now gone and the original pavilion has since been replaced, the park remains largely unchanged. Picture: Looking across Hednesford Park towards Hednesford Hills. The road near the centre of the image, winding into the distance, is now known as Valley Road. Once the site of a colliery, today it is a mainly residential area and the location of the Museum of Cannock Chase. The council, assisted by The Friends of Hednesford Park has successfully obtained a Heritage Lottery Fund Grant of £2.2M as part of the improvements to the park and war memorial. 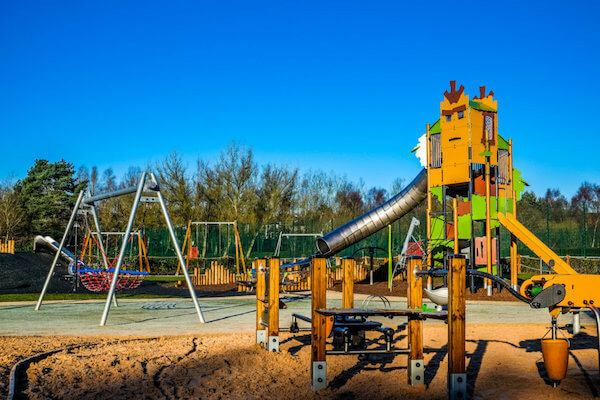 New toddler/junior, senior play areas and ball court have been built, the toddler/junior area are located adjacent the pavillion on one of the former bowling greens. The senior play area & ball court including a skate park are located to the west of the bowling greens and tennis courts.